“The leading Mexican voice in the U.S. media” (In These Times) on politics and economics in Mexico and their effects on the U.S.
One of the most trenchant critics of the Latin American scene and American foreign policy, Jorge G. Castañeda has been hailed as the “leading Mexican voice in the U.S. media” (In These Times). 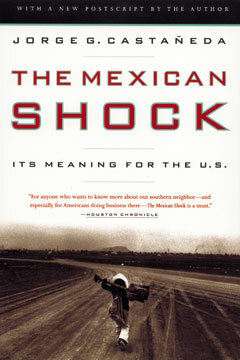 In The Mexican Shock Castañeda examines the major issues in Mexico in recent years and their effects on the United States: emigration, the relationship between politics and economics, the assassination of presidential candidate Luis Colosio, and the rapid devaluation of the peso. He also explores the United States’s changing perceptions of Mexico and the historical and cultural outlooks that still divide the two countries. Finally, he examines the campaign behind Proposition 187 in California, discussing the dangerous mix of ignorance and bias that has formed so much of America’s reaction to Mexico.